Government of the Pakistan Finance Division has issued Notification No. 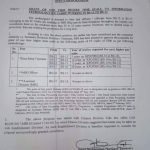 1(3)R-I/2010/2014 dated 10th September 2014 in connection with Upgradation of Superintendent by Federal Govt. One time grant of BPS-17 to all Superintendents working in BPS-16 irrespective of their length of service. In future three years (3 years) satisfactory service as Superintendent BPS-16 may be prescribed for grant of BPS-17 to them. Dear Supdt still no updates, as soon as i get the updates I ll share. Plz tell what is the outcome of FST judgement regarding grant of all facilities of BS 17 to Supdts. Can you please share the link for nomenclature higher than Superintendent, if someone is inducted as suptd directly then what are the chances of promotion? what is meant by regular post of bps-17 .is upgraded post in bps 17 considered as regular post? Dear Shahid I have not got any pay fixation of the Supdt. Sir, I want to know about the up gradation of superintendents working in the province of Punjab.It has come into our notice that chief Minister Punjab has approved the file.Is it correct? Dear Saeed Iqbal I have not the updates in this regard as soon as i get the updates I ll share. Thanks dear Zaheer for praying for me. I request to all the supdt of federal govt their voice and their rights will be highlights to the PM of pakistan and Finance Minister to provide the relief to all supdt as per speech in the National Assembly. I hope that Finance Minister necessary instructions may be issued to the Concerned for upgradation of Post of Supdt B-16 to B-17 as the same previously upgraded by the Govt i.e UDC B-7 to B-9 Assistant B-11 to B-14 And Stenotypist B-12- to B-14. these incumbent are taking full benefits of the upgraded post. I hope that the Supdt of PM Sectt and Finance Div and Estab Div. will play important role if they will discuss with the PM and Finance Minister with the evidences I hope that problem will be resolved very soon. Hope for the best but the post of Supdt(BPS-16) is already overdue for upgradation keeping in view the post of Private Secy which was earlier in BPS-16 in 1986. But the incumbents are active and very much close with the decision makers that's why they upgraded their post to BPS-17 and subsequently got grant of BPS-18 and BPS-19 as well. However, Supdt(BPS-16) post is still to be upgraded. FST decision in May'12 and case under process since then. After a lapse of 2 years and 4 months the case approved by the PM but Grant of BPS17 instead of Upgradation. I think there are many sympathizers of SUPDTS(B-16) who did'nt desire this posts to be upgraded otherwise there is no reason for upgradation of said posts. Inshallah, Allah would help this category of Govt servants provided they regularly pray and beg for help from God.Hoever, I am optimistic that our case will be reviewed soon and correction would be taken accordingly. Saeed SAhb, hope that this matter will be resolved by the govt in the light of previous upgradation of other posts. But struggle must be required from the superintendents of Federal Govt..
Dear Siddiqui sb I think some brain storming sessions are being underway. However, I like to suggest that a SPS BPS-19) case regarding change of status is subjudice in the Islamabad High Court. In case it is decided in favour of appellant then the Para 2(iv) of above cited notification would become nul and void ab initio. Hence incumbents may keep an on this case but I second you some positive collective struggle at every level is need of the hour. I agreed but please mobilize yourself and colleagues to initiate the case at Secretariate level. 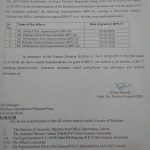 It may please be noted that the Finance Minister was announced in the budget speech the post of superintendent B-16 to be upgraded in B-17 and he was not ask to Section officer of finance division to use the word of time scale. The para 2 of the notification is completely contradiction of Speech of FM . The time scale will be granted by the govt. if any employee reached on maximum pay scale, due to Move over and selection grade policy has been withdrawn by the govt. in 2001. I hope that ministry of finance re issued the notification after removal of some words. The word of upgradation must be entered in the next notification after this correction relief will be taken by the supdt.B-16 to B-17 . .
Dear Siddiqui Saab! collective voice/efforts is need of hour by of All the Fed Govt Supdts(16) to record their point at appropriate level . Effective coordination may be undertaken to make it one strong voice however, it must be positive and through proper/legal channels like the one which was successfully anchored by the Cadre of Private Secretaries, Stenographer/Stenotypists in the past. Hope the Fin Div may review the decision and honor the words of its Honourable Finance Minister uttered during the Bgt Speech 2014 on 3 June, 2014 an the August National Assembly Hall which ought to be on the record of Assembly proceedings. AOA, Dear Mr. Saeed hope u will be fine and in best of "EIMAN". From the contents of ur writing u appear to be a superintendent. Its not only u every superintendent is concerned greatly with the finance division notification. 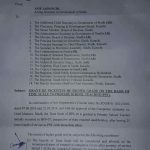 It is clear from Para-a of the said notification that as a one time measure its a grant of BPS-17 to all the existing incumbents. because there is no service limit for the existing incumbents therefore its not time scale for them. As far as admissibility of option for re fixation of pay after grant of annual increment on 01-12 is concerned, according to finance division clarification contained in office memorandum dated 23-10-2013 sr. 4 option for re fixation of pay will be admissible to superintendents as was allowed to private secretaries on the event of on scale move up. said notification is available on the web site of finance division. However if finance division does not issue any clarification regarding para-2(IV) superintendents will have to take the matter into the court. Hopefully it will be decided in the favor of superintendents as the FST had directed for up gradation not for time scale,secondly para 1 goes in favor of superintendents being without service limit. AOA, Dear Mr Raina thanks for your compliments. I hereby acknowledge your candid views on the instant notification and also thank you for the Fin divn clarification Om dt 23-10-2013. I will search the same on Finance divn web. I have no other option but to second your proposal regarding use of social media. However, my earnest request/desire is that we all incumbents may act in a most responsible/positive way so that we could galvanize the necessary support from all the respective quarters especially some sort of effort is needed by the Supdts working nearby Hon'able Finance Minister to get him apprised about the outcome of his Budget Speech and make him convince to realize his words or some of our brothers are also working in PM's Sectt who could also use their good offices to bring in the knowledge of Honorable Prime Minister about the commitment of Finance Minister at the NA on 3-6-14 viz-a-viz notification dt 10-9-14 especially the notification of Khyber Pukhtoon Khawa Finance Deptt dated 22-5-2014 as it is my considered opinion that how can Provincial Govt employees can be given a benefit which is not being granted to Federal Govt employees. The posts of Supdt(BPS-16) at KPK has already been upgraded to BPS-17 wef 22-5-14 with all administrative/financial benefits but the same has been denied to Supdts of Federal Govt despite having Article 25 of constitution of Islamic Republic of Pakistan 1973. We should be worried but act with 'HIKMAT' and contribute towards this genuine cause as much as possible irrespective of one's position/standing whatsoever. I pray to Almighty Allah to guide us on the true path to get resolve our prolong case of Upgradation. Ameen. Regards. 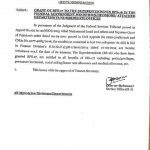 (a) The post of Supdt(BPS-17) may be upgraded as per FST judgement in May,2012 with efffect from the date KPK Govt given to its employees wef 22-5-14. 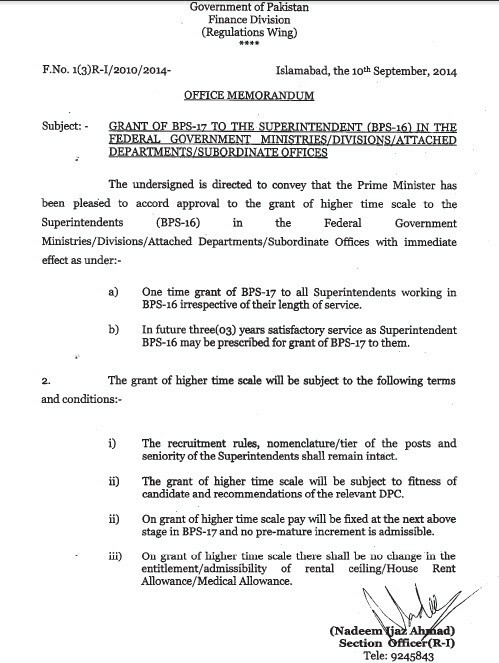 (b) Higher time scale of BPS-18 may be granted to all the incumbents after completion of 5 years service in BPS-17 and BPS-19 after 10 years of Service in BPS-17 alongwith the benefit of commuted service as has been extended in the case of posts of Private Secretaries and Senior Private Secretaries..
(d) The post of Asstt and UDC may also be upgraded on the lines of KPK Govt Notification to bring about uniformity in Federal and Provincial Govts employees. It is considered opinion that above proposal if approved by the Govt would provided a permanent solution to this category of Federal Govt Servants.Comments from all concerned are invited. AOA Respected Madam would you like to get clarification on Para-2 of Supdt(BPS-16) notification; (a) Is all proviso of Para 2 relates to grant of BPS-17 to Supdts(BPS-16) in future or is also applicable on the incumbents wef 10-9-14 (b) The incumbents are in continuous service ; are they are entitled to get annual increment on 1-12-14 of BPS-17 as no "PREMATURE" increment is admissible. Because most of the incumbents will get only benefit of Rs.800 on fixation of their pay at 'Next stage above in BPS-17' but at the cost of loss of Annual increment which is due on 1-12-14. Is it not disadvantageous and in conflict with the relevant provisions of Civil servant Act 1973 which says"Any change in terms and conditions of service and pay should not be disadvantageous to the incumbent civil servant". Pl take your time and make it convenient to solve the problem. regards. Dear Saeed, If it is so then it is a good news for the Supdts. I will confirm the same soon. Dear Saeed, I could not understand your question, plz in detail. 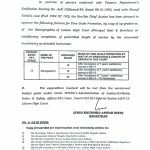 I am working as Assistant In BPS-16 against the post of Superintendent (BPS-16). Mujay bi 17 scale mil jaye ga ya nahin. Kiun k main already BPS-16 main hun. Because hamaray department mein koi seat Superintednt ki vacant nahin hay, muje department ne Superintedent k against BPS-16 dya tha. Muje koi benefit ho ga.
Dear Shafiq, Against post wala is ka musthaq nahin hay. Actual Post (Supdt) hi upgrada hua hay. I have to know about the news detail regarding the grant of 50% Risk Allowance to Military Accounts. Please inform me about the judgement. Dear Amir as soon as I get the updates I ll share. the joke of Grant must be amended to UPGRADATION as announced by Honourable Finance Minister on 3 June, 2014 at the National assembly floor. His spoken words ought to be translated as NOTIFICATION as it is maiden upgradation. The same has already been done y the Provincial government of KPK wef 22-5-14 therefore SUPDTS(BPS-16) are to double their efforts to realize the Fin Division that we would not accept such a mean treatment but FULLFLEDGE Upgrdation is required. amendment in this regard is better to be issued soon to fill up the disappointment amongst about 400 supdts and hundres of their family members. All Supdt are to stand positively at every forum and appeal to PM and FM to review the decision.Regards and beg a pardon for any wrong impression that could taken from this comment. 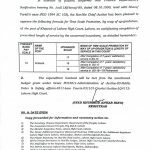 as SUPDTS(16) having 10-30 years service BPS-16 and PS has already enjoing BPS-19 and same is the case with other counter parts in Judiciary, Election commission and many others. Do you have any news regarding upgradation of MES (Military Engineer Service) store man, junior supervisor and senior supervision staff. Dear Asif, still no updates. The notifiction of upgradation of superintendent negates the budget speech of Finance Minister. This is called "surkh feeta"
Respect madam sindh. government suprintendent ka upgradetion ka notification kab tak nikale gi madam mujeh zaroor bataien thanks. Dear Farrukh as soon as it is issued I ll share it. Dear Muhammad Farooq, her category ka to confirm nahin hay. I hope in near future it will be clarified by the Finance Division. The order of upgradation of the post of Superintendents is totally wrong and unjustifiable , it is not upgradation order, it is higher time scale order which will not give financially benifit to the superintendents. Kindly remember the speech of FInance MInister who said in budget speech that the post of Superintendents are being upgradated from Bps 16 to 17. Sir, its very sad to read the notification. Our case was initiated/recommended for upgradation. Moreover, finance minister in his budget speech vide para 69(d) announced that. "The post of superintendent is being upgraded from grade-16 to grade-17". We should be given all benefits of upgraded post as earlier done. Thanks.